If you haven't already, see Overview for an overview of the ADM architecture. Obtain credentials describes the process of getting your initial credentials for ADM.
Before configuring your project, download the Amazon Mobile App SDK. By downloading our Amazon Mobile App SDK, you agree to our Program Materials License Agreement. Extract the SDK contents to a location of your choice. 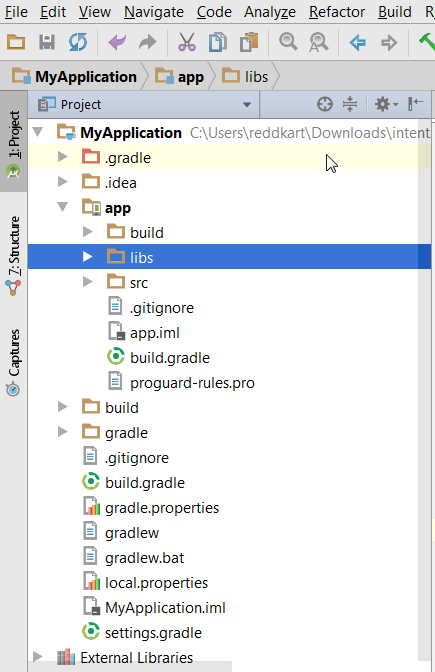 Make sure you have downloaded and installed the current version of Android Studio. 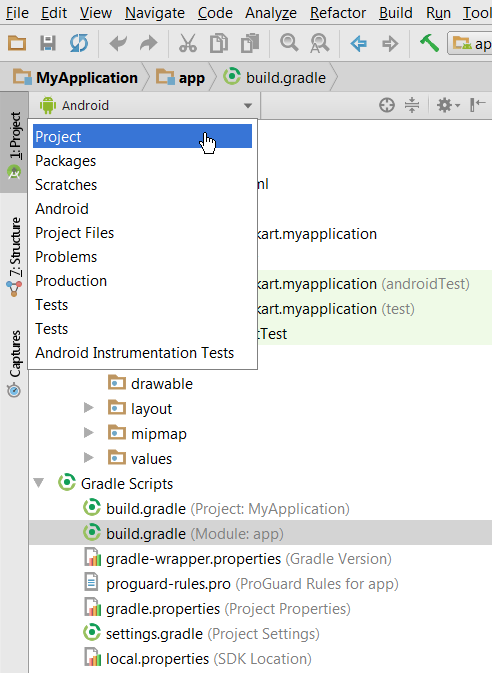 In Android Studio, create a new Android project or open an existing project. 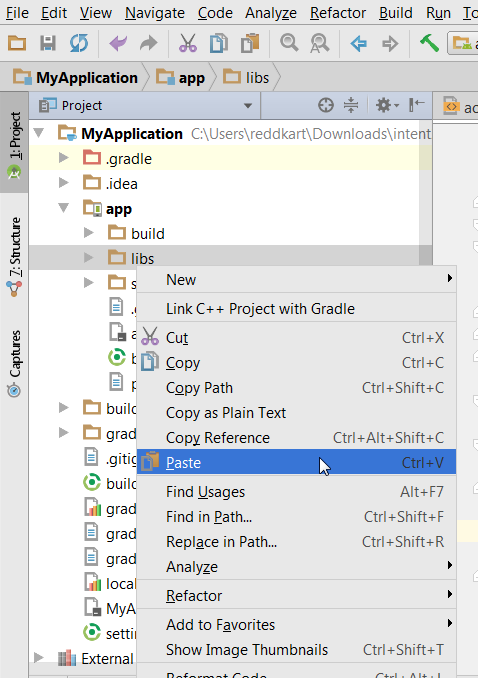 Change the folder structure from Android to Project. Search for the libs folder inside the app folder. Copy the amazon-device-messaging-1.0.1.jar file from where you extracted the ADM zip file. Paste the JAR into the libs folder. Right click the JAR file and at end click Add as library. 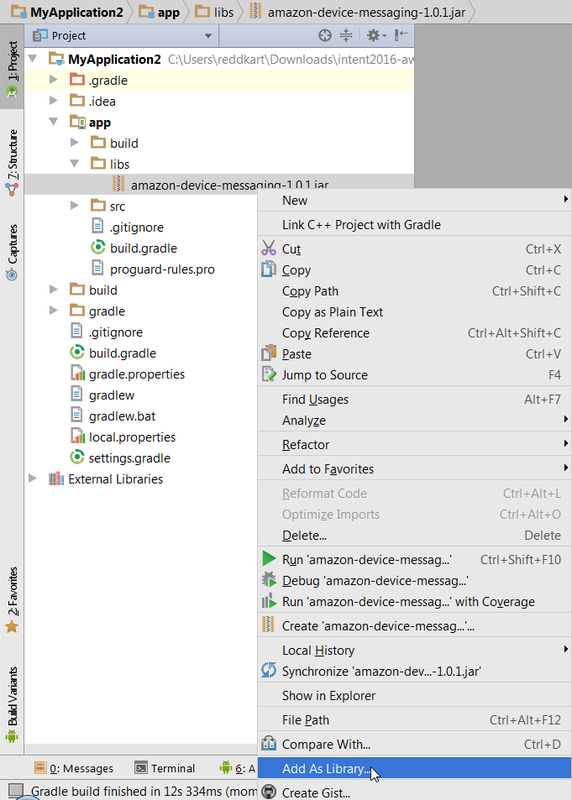 This automatically adds the compile files('libs/amazon-device-messaging-1.0.1.jar') command to the build.gradle file. Warning: Skipping this step will cause runtime errors. Before performing this procedure, update your AndroidManifest.xml file, as described in Integrate your app. Also ensure that you have Apache ANT installed, with your ANT_HOME, JAVA_HOME, and PATH environmental variables properly defined. Change directories into the Android SDK's tools/ path. Run a command with the following syntax, where <path> is the location where the project will be created, and <target Android platform> is the Android platform for which the project is intended. For a list of available platforms, run android list targets. At the root of your new project, create a new directory, called ext_libs. Navigate to the Android/DeviceMessaging/lib directory, in the Amazon Mobile App SDK, and copy the JAR file to your new ext_libs directory. Make sure that you take similar steps to configure the projects that test your app.